I´m so excited! I´ve been really looking forward to fall! Everything´s so wonderful about it: The colors of the trees, the leaves on the ground, you finally getting to wear warm sweaters and cozy socks, eat foods that warms you up from the inside, smell the smells from the kitchen of cinnamon and apple, paint your nails in burgundy, run through the leaves and take in the fresh air.. I could go on and on here. What´s your favorite part of fall? What are you excited about? To get you as excited as me about fall, I came up with a porridge that smells and tastes just like fall, warm, cozy, comforting… just like fall! You get what I mean when you try this! Enjoy! In a pan, heat up some orange juice or apple juice, which one you like best. Cut up the apples and add them in along with a pinch of cinnamon. At medium heat let it cook until the apples are soft, or if you want them not be as soft, just take them off the heat earlier. While the apples are cooking, add your oats in a pan along with some cinnamon. Mix everything and then heat it up a little. Wait about a minute while stirring, before you add water or apple or orange juice (or really whatever you like – I just find those three are the best for fall!). That way the oats are roasted a little and for me that really makes a huge difference in the flavor. Stir your oats a little while they cook. Add in a little honey or agave on the way and keep stirring! When they are done, after about 7 minutes (5-10 usually;-)) take them out and place them in a bowl. Add your apples. 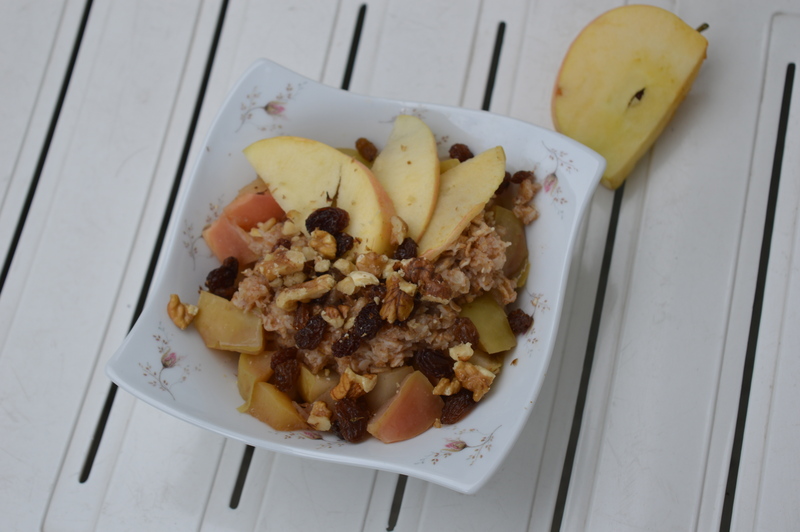 On top put some walnuts and raisins to really add a little more sweetness, fall-flavor and nutrients! Enjoy! :-)Happy making! Let me know how it turned out!